No matter how old your children are, there are bound to be messy faces, dirty hands and accidents abound that need to be cleaned up. I always thought there would be less mess as my children grew older but I honestly don't think that is the case. Whether you are wiping an adorable dirty face or a soft baby bottom, Bummas are the perfect choice from head to toe, an eco-friendly cloth baby wipe perfect for faces and bottoms! From wild ones to cool ones from boys to girls, they offer a variety of wonderful colors! I received a set of Wild Ones Bummas. The colors were bold and vivid: purple, orange, green, blue, pink. I LOVE THEM! Other than the wonderful colors, the next thing I noticed was how soft they were. They feel so soft against your skin, very soothing. Perfect for babies and children because there is absolutely zero irritation. My 8 year old daughter immediately tried to claim my Bummas as hers. She thought they would make the perfect blankets for her baby dolls and stuffed animals! She said... "They are so soft and pretty, I really want them!" No matter how many times I have used them and washed them, they are still as soft as when they arrived. They wash up wonderfully. Bummas are a wonderful gift for anyone expecting a baby. 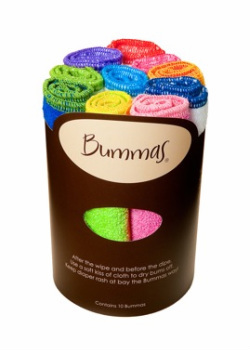 Bummas... a soft absorbent, luxurious baby cloth to soak up all the wetness. Bummas were recently awarded the Seal of Approval from PTPA and an Eco-Excellence award too! A soft kiss of cloth to dry bums off. This giveaway will end July 23rd at Midnight EST. Disclaimer: I received a complimentary set of Bummas eco-friendly cloth baby wipes from Bummas for the purpose of writing a review and hosting a giveaway. Regardless, I only recommend products or services I use personally and/or believe will be a good fit for my readers. The views and opinions expressed on this blog are purely my own. Results may vary. No monetary compensation was received. A: "Pat your baby dry with a clean towel. Don't scrub your baby's bottom. Scrubbing can further irritate the skin." I learned that Bumma is parent tested and also parent approved by the PTPA. They won awards. They're Eco friendly and that's important to moms.Thanks for the giveaway! I learned the new pricing for 2012 is just $15 a set. Bummas will be featured in the July/August issue, available on IPad and on hundreds of newsstands nationwide including Whole Foods and Barnes and Noble. I learned the pricing for 2012 is $15 a set. they have won lots of awards! keep up the good work! With a little douse of water, they can replace commercial wipes for clean up of sensitive bums. Thanks. New PRICING for 2012...$15.00 a set.